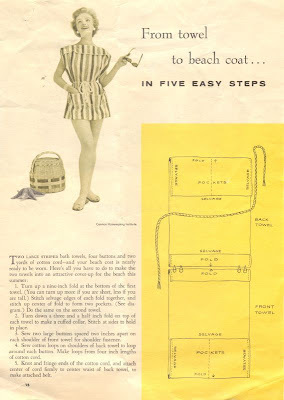 Glamoursplash: From Towel to Beach Coat in Five Easy Steps. Two large striped bath towels, four buttons and two yards of cotton cord - and your beach coat is nearly ready to be worn. Here's all you have to do to make the two towels into an attractive cover-up for the beach this summer. 1. Turn up a nine inch fold at the bottom of the first towel (you can turn up more if you are short, less if you are tall). Stitch selvage edges of each fold together, and stitch up center of fold to form two pockets. 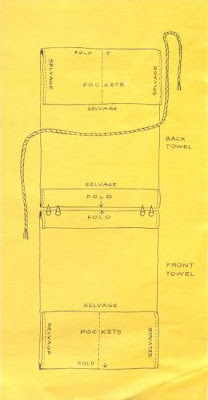 (See diagram) Do the same for the second towel. 2. Turn down a three and a half inch fold on top of each towel to make a cuffed collar. Stitch at sides to hold in place. 3. Sew two large buttons spaced two inches apart on each shoulder of front towel for shoulder fastener. 4. Sew cotton loops on shoulders of back towel to loop around each button. make loops for four inch lengths of cotton cord. 5. Knot and fringe ends of the cotton cord and attach center of cord firmly to center waist of back towel to make attached belt. You can get creative with the color of the towels (and or fabric you choose) and cording and even the buttons to create a look that's all your own. You could even make one to match each swimsuit you have. Soft, absorbent and totally easy! Enjoy!